First Saturday of the Month Dog Pack Walk—No Fee, Just Fun! Join us to build community while you exercise and socialize your dog! Everyone is welcome, free of cost. One hour group dog walk, with optional obedience circle. 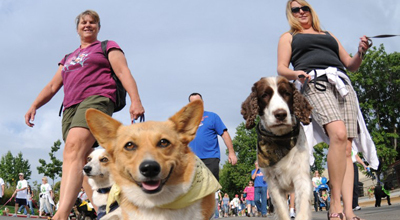 Explore Palo Alto neighborhoods, visit dog-friendly businesses, meet other dogs & owners. Meet at Paly parking lot, Embarcadero/El Camino side. Bring a leash, water, poop bags & treats if you use them (no flexis/long leads, dogs walk by our side). First Saturday of the month, next walk is July 6th. Come at 9:30am for optional info session and obedience circle. Group pack walk departs 10am. Palo Alto Dog Pack Walk is brought to you by the Friends of the Palo Alto Animal Shelter as a community service and educational program. Led by experienced dog trainers. Contact Cathy Kirkman 650-714-8509 or cathy@paloaltodogs.com. If your dog is iffy around other dogs, we can help to integrate them. Interested in being a pack-walk ambassador for your neighborhood, let us know!